Welcome to the world of Current Affairs 2017. 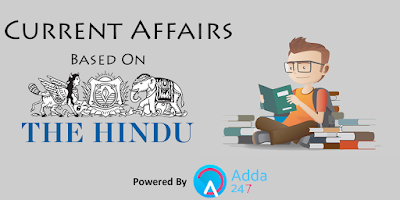 With IBPS Clerk Mains round the corner, it should be your priority to cover every aspect of Current Affairs on a daily basis for IBPS Clerk so that you can do well in the exam. These current affairs are based on current news. Let us see how many questions you attempt accurately. Q1. The Centre unveiled the contours of the ______________ scheme, which seeks to ensure the flow of clean money to political parties, without revealing the donors’ names. Sol. The Centre unveiled the contours of the ‘Electoral Bonds’ scheme, which seeks to ensure the flow of clean money to political parties, without revealing the donors’ names. As per the Finance Minister Arun Jaitley, the electoral bonds will be a bearer instrument in the nature of a Promissory Note and an interest-free banking instrument. Q2. The Centre has recently approved an MoU between India and _____________ to improve public transport in the country. Sol. The Centre approved an MoU between India and London’s transportation authority to improve public transport in the country. The MoU is aimed at improving the overall public transport system, improve passenger services and promote the use of high capacity buses in India. Q3. Cabinet has approved the Agreement between India and Myanmar on Land Border Crossing. What is the capital of Myanmar? Sol. Cabinet has approved the Agreement between India and Myanmar on Land Border Crossing. The Agreement will facilitate regulation and harmonization of already existing free movement rights for people of both countries. The Capital of Myanmar is Naypyidaw. Q4. External Affairs Minister Sushma Swaraj left on a 5-day visit to three South East Asian countries. Which among the following is not one of them? Q5. The Cabinet has recently approved the signing of MoU between India and Israel on cooperation in the ________________. Sol. Cabinet has approved the signing of MoU between India and Israel on cooperation in the Oil and Gas Sector. The cooperation envisaged under the agreement will facilitate promotion of investments in each other’s countries, technology transfer, R&D, conducting joint studies, capacity building of human resources and collaboration in the area of Start-ups. Q6. Name the former-RAW chief who was appointed the deputy National Security Adviser (NSA) of India. Sol. Rajinder Khanna was appointed the deputy National Security Adviser (NSA). He was the former chief of the country’s external intelligence agency Research and Analysis Wing (RAW). Q7. The Indian Institute of Corporate Affairs (IICA) and India Post Payments Bank (IPPB) signed an agreement for the training of employees of the latter in the area of payment banking. Who is the present DG & CEO of IICA? Sol. The Indian Institute of Corporate Affairs (IICA) and India Post Payments Bank (IPPB) signed an agreement for the training of employees of the latter in the area of payment banking. Gyaneshwar Kumar Singh is the DG & CEO of IICA. Q8. National Mission for Clean Ganga (NMCG) has approved five projects in three states worth Rs. 295.01 crore. Which among the following state is not among them? Sol. National Mission for Clean Ganga (NMCG) has approved five projects worth Rs. 295.01 crore. Three projects pertain to sewage management in West Bengal at an estimated cost of Rs 278.6 crore, one relates to sewage management in Uttarakhand at an estimated cost of Rs 4.68 crore and one project worth Rs 11.73 crore is related to ghat improvement works in Varanasi, Uttar Pradesh. Q9. The Andhra Pradesh Grameena Vikas Bank (APGVB) has operationalised its first desktop ATM in Telangana. Who is the present chairman of Andhra Pradesh Grameena Vikas Bank? Sol. The Andhra Pradesh Grameena Vikas Bank (APGVB) has operationalised its first desktop ATM in Telangana. The mini-ATM within the branch premises will facilitate customers to withdraw small amounts. Narasi Reddy is the present chairman of Andhra Pradesh Grameena Vikas Bank. Q10. The National Security Council of India is headed by _____________. Sol. The National Security Council is headed by the prime minister. It is the apex body on all internal and external security-related matters. National Security Adviser Ajit Doval is its secretary. Q11. The Reserve Bank of India has initiated 'prompt corrective action' (PCA) against Allahabad Bank over its high bad loans. It Headquarters in ____________. Sol. The Reserve Bank of India has initiated 'prompt corrective action' (PCA) against Allahabad Bank over its high bad loans. Allahabad Bank MD & CEO- Usha Ananthasubramanian, Headquarters- Kolkata. Q12. The NABARD has sanctioned _____________ loan assistance under the Rural Infrastructure Development Fund (RIDF) to Odisha towards irrigation and rural bridge projects. Sol. The NABARD has sanctioned Rs 372.51 crore loan assistance under the Rural Infrastructure Development Fund (RIDF) to Odisha towards irrigation and rural bridge projects for the last quarter of this fiscal. Q13. Health and Family Welfare Ministry has recently launched the country’s first digital Online Oncology Tutorial Series. It had been designed by _____________. Sol. Smt Preeti Sudan, Secretary (Health and Family Welfare) launched the country’s first digital Online Oncology Tutorial Series designed by the Tata Memorial Center in collaboration with the Health Ministry. Q14. Oncology is a branch of medicine that deals with the prevention, diagnosis, and treatment of ____________. Sol. Oncology is a branch of medicine that deals with the prevention, diagnosis, and treatment of cancer. Q15. Mumbai-Headquartered NABARD was established on _______________. Sol. NABARD stands for National Bank for Agriculture and Rural Development. NABARD was established on 12 July 1982. Headquarters- Mumbai, Chairman- Harsh Kumar Bhanwala.